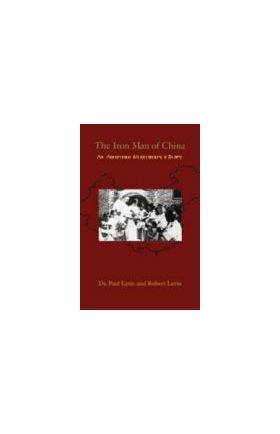 Without knowing anything about the man whose life is recounted on these pages, The Iron Man of China may seem a curious title. Except for a year furlough home in the states, Father Lavin served the Chinese people for twenty years (1932-1953), traversing thousands of miles by foot or bicycle, and exposing himself every day to life threatening dangers. In 1953 the Communists expelled him from the mainland threatening him with death if he should ever return. 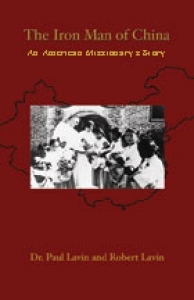 This well-documented book, written by the Iron Man’s nephew, illustrates one of the reasons why there are ten million Catholics, loyal to Rome, in China today. This book is dedicated to the family of Joseph and Catherine Lavin of Framingham, Massachusetts. Joseph was born in Manchester, New Hampshire, on December 24, 1874; he died on November 13, 1955. Catherine was born in Porta Down, Armagh County, Ireland on June 10, 1874, and she passed away on February 2, 1960. Their children’s generation began with the birth of their son, Charles, on October 15, 1898. It ended with the death of their daughter, Elizabeth, who passed away on January 9, 2000. Catherine bore eight other children in her fifty-plus years of marriage to Joseph Lavin. One of the these, Joseph Patrick, became a Maryknoll priest and missioner to China. The ten Lavin children were raised in a strong patriarchal family. Their father was not merely a devout Catholic personally, but also an active member of many of the Church’s organizations that were dedicated to charitable works. His wife Catherine strongly supported him in these endeavors. Those of us who were Joseph and Catherine’s second generation of offspring, heard endless stories from friends and neighbors, as we grew up, about our grandparents’ and parents’ hard work ethic, their honesty and generosity, and even their athletic prowess. The legacy left to us by our parents’ generation was one of which we were all proud, and one that we hoped to pass on to our own children. Passing on a legacy, however, is not a simple matter, particularly in this day and age, when employment forces so many families to move to and fro just to make ends meet. Members of even the closest-knit families often find themselves separated by great distances. And, even if they are fortunate to live in the same locale, they often have difficulty finding the time to get together to renew old ties and to reflect on the past. Sadly, the bonds that once united great-grandparents, grandparents, aunts, uncles, and other relatives have been weakened and, in some cases, often forgotten. For many, the knowledge of, and loving admiration for, those who preceded them is missing. Yet, it was their faith and moral integrity that provided unity and direction to the generations that followed. A noble legacy, fostered and nourished, gave meaning to being a member of that particular family. Without that, cracks in the family structure occur; the separation between generations widens; and what was once a source of security, vitality, and inspiration erodes into ruins. Eventually, be it from sheer neglect or some unworthy obsession, the familial bond disintegrates, unnoticed by the disconnected generations that follow. The generation of Lavins that preceded the authors’ was joined together by an adhesive that was not going to be undone as decades passed. Joseph and Catherine were fervent Catholics who passed a strong faith on to their children, who, in their turn, did the same with their own offspring. That it was the holy faith that cemented our family together, giving to each and all the strength to endure in times of sacrifice and suffering, is markedly evident in the family photo below. Father Joseph Patrick Lavin occupies the central place in this photograph. This arrangement did not occur by chance, but by design. Father Lavin was, in fact, the essence of what this generation of Lavins admired and stood for. Like a living coat of arms, with real faces rather than symbols, this picture seems to radiate that divine economy that Christ intended the Christian family to be. To Father Joseph Patrick Lavin, his parents, brothers and sisters, your grateful children dedicate this book. The years from 1929-1932 were the time for building the physical, psychological, and spiritual endurance that would be needed to survive and prosper in a far-off mission land. This was also the time to be immersed in theology and academic work. A thorough grounding in the Catholic faith: dogmatic, scriptural, sacramental and moral theology, and the mastering of all the pastoral applications of the one true religion was imperative if the missioner was to communicate that faith intelligently to those who had little, if any, understanding of it. These were the years in which Joseph Lavin began his studies in the Chinese language, and the Chinese culture, as well as the time for learning all the ordinary, practical aspects of living in a society so markedly different from his own. While it would take years of first-hand experiential knowledge to become truly proficient and comfortable in the language and the customs of the people, it was essential that he acquire enough knowledge to be able at least to get his foot in the door once he arrived on the foreign shore. Too, this was a time for the Massachusetts seminarian to get prepared physically in order to face the harsh environmental and primitive conditions of Chinese life. Learning to ride a bicycle over unpaved terrain and preparing one’s feet to walk long distances for days on end, over steep mountains, through muddy rivers, were essential for survival. Convenient and comfortable transportation, and even maps, would be in short supply. As for a trolley? — not in China; and even if you could afford a rickshaw — what kind of a missionary would even think of riding in one amidst a squalor that was so ubiquitous? The years to come would not be like a leisurely trek down the old railroad tracks back home, and they certainly were not going to provide a missionary with paved roads and city sidewalks. This was a time to learn to become a jack-of-all-trades. As mentioned earlier, a Maryknoll missioner had to learn the basics of plumbing, carpentry, mechanics, and those other hands-on skills needed to maintain a residence and a mission complex. A missionary had to be a doctor and a nurse; he had to have an understanding of medicines and herbs, of how to care for wounds and fractures and common and unusual diseases, when to quarantine and how far to press the issue, and, most importantly, he had to know how to minister to the dying and to their grieving families. He had to be a full-time priest as well as a part-time psychologist. Simply put, a missionary in China would not have access to a skilled craftsman or a doctor when complications arose. If he did not have the capability to solve the practical problems of everyday living, he could easily become overwhelmed and lose his missionary zeal. Learning to do all the practical things, that are too often passed off onto some specialist, was not an option. Rather, acquiring these skills, and being able to employ them with facility, was a must. There were many letters written from Ossining to Framingham. In his correspondence, young Joseph tells his family of both the challenges of a consecrated life and the ordinary daily activities that mothers need to hear about. He writes of contemporary heroes, like Father James A. Walsh, and the example that they set for the young men aspiring to be like them. There is nothing spectacular in these letters: no visions, no ecstasies. What there is, however, when one reads between the lines, is the journey of a generous soul growing in wisdom and grace. In these letters the future missionary opens his heart to his parents regarding his preparation for ordination, his first Solemn Mass, and his assignment to China. The account of his separation from his family, particularly his mother, is as inspiring as it is tenderly moving. And, finally, there is the relation of the Nineteenth Departure Ceremony that took place at Maryknoll on Thursday July 28, 1932. The solemnity of this moment, and the profound meaning of what the ceremony meant to these newly ordained missionaries, is beautifully captured in one of the letters. For Father Joseph Lavin, July 28, 1932, was one of the last few days that he would spend on American soil for many years to come. Neither he nor his family knew it at the time, but Father Joe would spend the next fifteen consecutive years (twenty-one in all) in China. The season of Advent is here. Three weeks from tonight it will be Christmas Eve. How the time goes. As Christians, we should all prepare ourselves for the coming of the infant Jesus. On his birthday, we should present Him at least with a spiritual gift. Do not let these days pass without thinking in a vivid manner of the child of the crib. Say four thousand Hail Marys in remembrance of the four thousand years that the world waited for the coming of the Redeemer. Enclosed you will find the gift of a spiritual crib. This is for everyone. The penitential season is knocking at the door. For the past three Sundays — Septuagesima, Sexagesima, and Quinquagesima — the liturgy of the Church had put on, in a small degree, the penitential vestments and signs. At Mass, the ministers have vested in violet vestments, the Gloria in Excelsis has been omitted, and so has Ite Missa Est at the end of Mass. The spirit of penance pervades the office. March 5th is Ash Wednesday. Wednesday marks the beginning of Lent and terminates on Easter Sunday. Easter is very late this year. On Ash Wednesday, the priest blesses the ashes before Mass and distributes them. When putting the ashes on the forehead of a person, the priest says “Memento homo, quia pulvis es, et in pulverem reverteris” — “Remember man that thou art dust and unto dust thou shall return.” In the Old Testament, sackcloth and ashes were the signs of penance. So it is very appropriate for the Church to begin the solemn part of the year with ashes as a symbol of repentance. What are we going to do during the holy season? Some form of penance ought to be undertaken. No, nothing big, but deny ourselves a few small things. Be discreet in the line of penance. I know you are all planning to do something during these forty days; and let us repay God Almighty for our past offenses. Happy New Year! No, I am not too early, in the eyes of the Church. The Catholic Church begins the new year with the first Sunday of Advent.
. . . During this time, the Church endeavors to prepare her children for the coming of Christ. This season is penitential in its discipline, ceremonies, and liturgy. In the early days of the faith, the people, according to the law of the Church, observed a rigorous fast and performed extraordinary acts of penance. Lent and Advent resembled each other very much. But, in modern times, this particular aspect of Advent is in the background, so the Church by means of her prayers in the Mass and Divine Office brings this fact to mind. The discipline is very mild, but, at the same time, we can all mortify ourselves in some little thing and offer this to the Christ Child as an act of self-denial. For instance: don’t eat candy, or cut down the candy supply; give up smoking or only take a couple of pipe-fulls a day (today this holds for the ladies); give up something at table; good reading about fifteen minutes a day; go to Mass and Holy Communion during the week; visit the Church; say the rosary and Stations daily; practice ejaculatory prayer, etc. The penitential strain is very visible in the ceremonies. The color of the season for Mass is violet, except on feast days. Violet denotes penance. The deacon and subdeacon do not wear the dalmatic and tunic but chasubles folded up in the front. The Gloria in Excelsis is not said. “Benedicamus Domino” is said at the end of the Mass instead of the words of joy “Ite Missa Est.” The Epistles, Gospels, Orations, etc. bring forth in a very vivid manner the penitential aspect and urge us very strongly to prepare for the coming of the Christ Child. Flowers are not permitted on the Altar. The organ is not played, except for the purpose to sustain the music. At the same time, there is an evident strain of joy running through the entire liturgy. . . .
Of course, most of Father Joe’s correspondence during these years was not so pedagogical in nature. Usually, he was simply describing the ordinary activities in which the seminarians were engaged, or the challenges they all had to endure. He wrote informally about studies, extracurricular activities, the sports and required hikes, the manual labor program, and whatever he was at liberty to relate of their religious duties. One such letter, dated June 8, 1930, to his father, was very typical. It could have been written by any seminarian anxious to make his father proud. Last Monday the day of judgment took place. It is tough when we have to experience more than one such day. Dogmatic Theology in the morning and Liturgy in the afternoon. Both of these exams went very well. Tuesday morning we met and battled with Moral Theology — not so long and good. The boys were set for a long struggle in Ecclesiastical History. Talk about a marathon race. It had nothing on this exam. Wednesday was a free day and [we had] a ball game with the Josephites from up the river. The Josephites take care of the colored missions in the country. Their preparatory college . . . is located in Newbury, N.Y. about thirty miles from Maryknoll. Their seminary is in Washington, D.C. We expected to have a ball game, but were sadly disappointed. The game proved to be a batting practice. The Knollers won 17 to 1. The visitors scored in the ninth. The boys don’t enjoy this brand of ball. . .
Scripture exam on Thursday. This exam is always long and tiresome. I wrote and said a few things in exactly two hours and a half. Not so hard. Canon Law in the afternoon proved to be a short one and the written tests were over. Oral exams on Friday morning. The professor shot a few questions at me between 9:30 and 9:40. Ten minutes are plenty. The exams for the school year of 1929-1930 are over and gone — Deo Gratias — Thanks be to God! . . . I was going to write immediately after the exams, but the spirit was willing and the flesh was weak. . . .
Today, the feast of Pentecost or Whit Sunday, is one of great solemnity in the Church. On this day nearly two thousand years ago the Holy Ghost, the third person of the Blessed Trinity, descended upon the Apostles while they were united in prayer. These crude men were filled with the Holy Ghost and they started on the mission to convert the world to the crucified Savior. You all know the story of this day. . . .
Tuesday, June 10, is Mother’s birthday. I know you will all try your best to make this day one of extreme happiness for her. May God grant her many happy birthdays. Sister Marguerite’s birthday comes on the 17th of June. I know you will remember her in some manner. I had a nice letter from her about ten days ago . . . Hope you, Mother, brothers and sisters are well. I am fine. Regards to all the Lavins. February 24, is the birthday of this great man. Yes, of one who is little known in the world, except in a few circles, and in the wisdom of the world would be classified as a fool. The tendency of a worldling is to look upon and consider anyone in the religious life as a madman or a crazy fool. This man is a fool, but a fool for Christ. Jesus Christ, Creator of heaven and earth, was considered an impostor, a madman, a fool, by his own creatures while in this valley of tears. The Son of God died as a criminal upon the cross between two thieves. It is a wonderful consolation to be a fool for Jesus and spend our life in His service. Fr. James A. Walsh, founder and Superior General, is the man in question. If he was in the world, he, in all probability, would make a name for himself and enjoy the best that this prior existence has to offer. If he had remained in the diocese of Boston, he would be numbered among the Prelates in the Church. Yet, he has declined to accept the honors of the Church. . . . I could write page after page about the zealous servant of God. We all celebrated his birthday with much jubilation. The community presented him with a large spiritual bouquet of Masses heard or said, Communions, Stations, etc. Fr. General is sixty-four and as young as ever. He is very active and doesn’t betray his age. May God grant him many more happy years with his spiritual children. The veteran Father Cairns had served as a missionary on Sancian Island, the very place where, on December 2, 1552, Saint Francis Xavier commended his soul to God. Father Cairns had been part of the first mission contingency to enter China in Maryknoll’s fledgling years, and his holy labor, especially on Sancian, endeared him to a people who were not at all receptive in the beginning. Young Joseph did not know it at the time, but, many years later, he was to become a very critical connection to Father Cairns and his mission during the Japanese occupation of China. On numerous occasions Father Joe would risk his life by running the Japanese blockade to bring food to the island. Moreover, it was Father Joe who would be the only Maryknoller to witness Father Cairns’ death at the hands of the Japanese on December 16, 1941. From a nearby island, Father Lavin could only watch at a distance as the holy man was taken out on a gun boat, bound, put into a bamboo crate, and then lowered into the sea. The year, 1932, was a momentous year. It was the year of final preparation for Joseph Lavin’s ordination to the priesthood. His letters during this time were filled with accounts of the activities surrounding the preparation for this great event that would take place on June 5th. Interestingly, the relevant letters, with all the complicated considerations (invitations, plane, bus and train schedules for the guests), were written to his father who gladly employed his pragmatic expertise in helping his son with these worldly matters. Then, too, making arrangements for young Joseph’s first Solemn Mass on June 26, also required much attention to detail. Joseph senior was given that dutiful honor as well. Sadly, young Joseph’s mother, Catherine, was too ill to attend either event. Although it cannot be confirmed for certain, more than likely her son’s petition to the Boston chancery for permission to come and offer a Mass for his mother at the Lavin home was granted. The time for the big day is getting closer and closer. About nineteen more days and the desire of my life will be here. As we near the destination, I feel all the more unworthy, but Jesus Christ will assist me in this stupendous undertaking and help me with His manifold graces. This is the way that I feel about the whole thing — Jesus has chosen me, and He has guarded and watched me during these years, and this is an infallible sign of a true vocation to the priesthood and more so to the missions in distant lands. Glad to hear that you and the rest of the family took the appointment so well. What difference does it make in the end? Everything will pass away. God gave me to you to give me back to Him. This is the best possible return; just try to imagine the happiness and joy of ordination day and more so of the heavenly jubilation. If the cold arm of death had taken me — my earthly career would be over. If I got married, maybe I would move away, and we would see each other very seldom. But now everything is rosy. I shall always be of the household and never separated. My life’s work is one of love, sacrifice, and charity. All of you will participate in my prayers, sacrifices, and good works. You will be constantly on my mind. Mother, bear this picture in mind. When Christ was starting out on His public career and missionary activities His Blessed Mother kissed Him goodbye, and with heavenly joy in her heart, and a celestial smile, she bade her boy goodbye and Godspeed. Yes, I am sure you will play the part of the Blessed Mother in regard to your son. Rejoice and be glad because the Lord is good. Departure ceremony at the Knoll is on July 28. Our group sails from the coast on August 6. Tell Mary I sent extra envelopes last Saturday. They are bound to spoil some of the envelopes and these extras are just for that purpose. Tell her to send the envelopes as soon as possible. If she can’t get some of the addresses, forget about them. Received Father’s last letter. On Thursday, July 28, 1932, Father Joe joined the nineteenth group of Maryknollers departing for the Far East. He followed many courageous pioneers who already had established a “beachhead” in China and were now attempting to expand the peace of Christ throughout the mainland. China, as a nation, had never been conquered for Christ. As a whole, the entire Far East, with the exception of the Philippine Islands, Korea and Vietnam, preferred Buddhism, or Shinto, or Taoism, if not forced by the sword into Islam. Saint Francis Xavier himself had little success in this part of the world, if one measures success by the numbers of converts rather than by the quality. Those Orientals who did embrace the true religion over the later centuries did so with a holy zeal that was simply glorious. Their perseverance in the faith, even without priests and the holy Mass, proved their fidelity. Their Catholic fortitude, under unheard of tortures, populated heaven with many of its most resplendent martyrs. Yes, the Church Militant was true to her name in Father Joe’s day. It was a time when the primary purpose of missionary work was not simply the performing of good works, but challenging disordered consciences that needed to be upset in order to be healed. The conversion of souls to the Catholic faith was the main objective. It was necessary for salvation. How deeply ingrained this dogma of salvation was to the true Maryknollers can be seen from the Hymn for the Nineteenth Maryknoll Departure Ceremony, as it was sung in 1932. Here are the very lines those missionaries sang before boarding their ship. The day has come at last the day of joy. How beautiful the feet of God’s apostles! We kiss those feet with holy, loving awe. Where error’s darkness reigns with death. Proclaim afar the sweetest name of God. We meet again one day in heaven’s land of blessings. To be apostles of the Sacred Heart. To work with you and share your crown! Contain as in an ark our pledge of love. Let prayer be unto us a link of love. In life and for eternity. The missionary priest was sent forth in the service of Jesus Christ as His apostle (the word apostle means “one who is sent”); and he went forth to preach His doctrine to pagans, tyrants, the humble, the proud, the indifferent, the searchers, those of good will, those of bad will, to kings and to slaves. Crosses and trials were his daily bread. They were embraced as blessings.